Steelhead Jig Packages include a variety of select styles and colors to meet all your jig fishing needs. All salmon and steelhead jigs are poured, painted and tied to perfection on super strong, needle sharp Owner hooks. Three popular sizes to choose from. Unless specified, 1/4 & 1/8 oz jigs are tied on 1/0 hooks, 1/16 oz are tied on size 1. The popular Flashback Jig combined with a new Metalic Vinyl Paint has been field tested extensively and the results have been very pleasing. This jig has it all! Vibrate painted heads, Contrasting body materials and a Zonker rabbit tail with a hint of flash. If your looking for a jig that really pops in the water, this is a must have for your jig collection. From head to tail, UV Micro Hackle Steelhead Jigs these micro hackle jigs are loaded with uv material. The jig heads are UV painted and then tied with a variety of UV enhanced materials in fish catching colors in sizes 1/64 - 1/16 ounce, on Mustads 2X strong hooks. Give these jigs a try, you won't be disappointed. From the West Coast to the Great Lakes, Mini Marabou Steelhead Jigs are perfect when the water conditions demand a small presentation. These 1/32 oz jigs are tied on Mustad's 2X strong size 4 hook. Select marabou make up the tail and body. 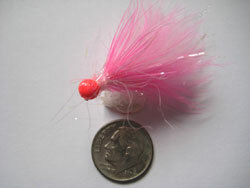 A palmered hackle collar and a colorful jig head complete this little beauty. Designed specifically for those ultra low water clear conditions where small presentations,light lines and long rods are the angler's choice. Micro-Marabou jigs are tied on Mustad's 2X strong needle sharp hooks. This stout sturdy hook is an excellent choice for fishing small jigs for Salmon and Steelhead. 1/16 oz jigs are tied on a size 2 hook, 1/32 oz jigs are tied on a size 6 hook, 1/64 oz jigs are tied on a size 8 hook. 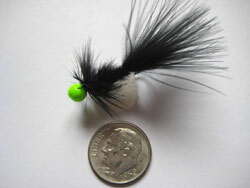 Beautiful schlappen feathers are blended together giving this jig a fantastic look in the water. 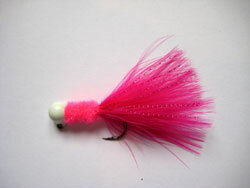 The palmered feathers give this jig a nice full look that move with the slightest current. Each Schlappen jig head is painted with a matching tail color and dipped in clear gloss. A proven jig for taking steelhead and salmon. 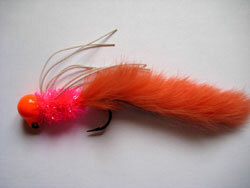 This is a highly effective jig for both steelhead and salmon throughout the entire year and one of my favorites. Beautiful schlappen feathers are blended together giving this Double Beaded Schlappen jig a unique look in the water that pulsates with every movement. Fluorescent red salmon beads and the jig head are given a clear coat of gloss that gives it a look that fish can’t resist. Marabou jigs are one of the originals and best fish catching jigs. 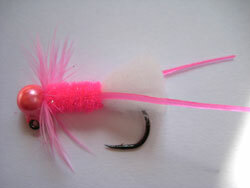 Select marabou blumes are palmered together forming a very nice full body jig. 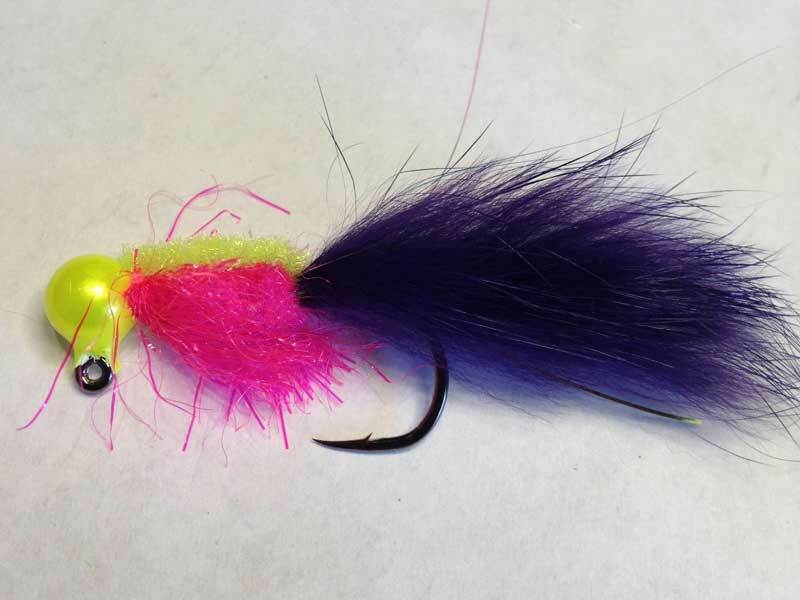 By blending two colors of marabou, a touch of crystal flash with a colorful jig head, you get a jig that looks very enticing in the water and pulsates with every movement of the float. A great choice to take both steelhead and salmon. 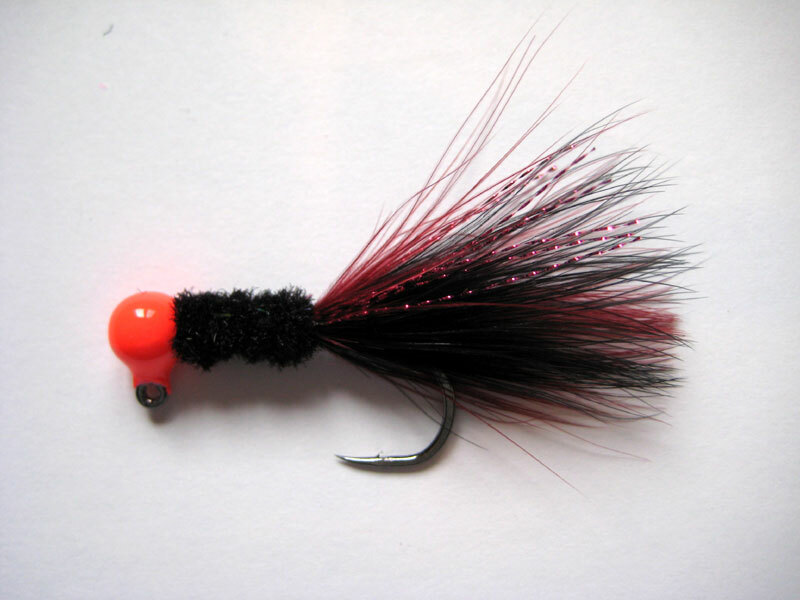 The single bead hackle-tail jig, which has proven to be a very effective lure for catching steelhead and salmon, is a combination of the finest jig materials found on the market today. The jig's body is made of schlappen and a single red salmon bead. Colorful vinyl paint, a touch of crystal flash, and a long hackle tail are added to the jig to give it a look fish can't resist. The single bead hackle-tail series jigs are tied in a variety of colors and are built to last. Rabbit fur has a unique pulsating action that is very good for producing strikes. 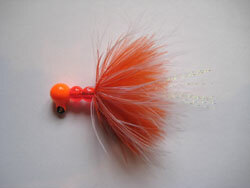 Bright colored heads combined with a fluorescent red salmon bead can be just the ticket for putting fish on the bank. 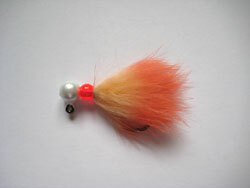 When tied on a smaller jig head, these Rabbit Fur jigs are ideal when the water is low and extremely clear. This series can also be tied with two beads for normal water conditions. They have been one of my "go to" jigs for many years! Rabbit fur has a unique pulsating action that is very good for producing strikes. Bright colored heads combined with two colors of rabbit fur will consistently produce strikes. 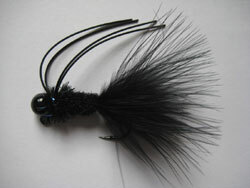 These Rabbit Fur jigs are tied in a variety of colors and sizes to mach all water conditions. Make sure to have a few of these in your jig box at all times! Simple and sweet is the best way to describe these jigs. Yarn tail jigs have been around for many years because of their versatility. They are ideal for adding scent, fishing them with a piece of shrimp, or just using them straight out of the package. They come in an assortment of eye catching colors in Available in sizes 1/4 oz down to 1/64 oz. This attractive variation of the Glo Bug yarn tail jig has proven to be very effective for catching winter steelhead this season. The hackle collar along with the two rubber squid tails is just the ticket for enticing those winter fish into striking. Each Glo Bug Squid Tail jig head is finished with a pearl finish and tied on an Owner hook. Just what the name implies! These jigs are excellent in all jig water conditions. A chenille body and a marabou tail with a touch of crystal flash is just the ticket to entice a strike. Tied on a strong needle sharp Owner hook, these Low Profile jigs are an excellent choice for both summer and winter steelhead. 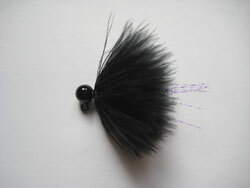 For a buggy look, these jigs can also be tied with a hackle collar. Never leave home without a handful of these High Impact Jigs. Available in sizes 1/4 oz down to 1/64 oz. 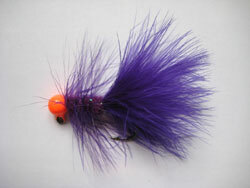 UV "Buggers" are the famous Wooley Bugger jigs loaded with UV material from head to tail. They are created to have a larger profile with lots of movement. If you are looking for a jig with the popular UV material, then this is the jig. These Wooley Bugger Jigs are tied with and without UV Materials in sizes from 1/4 oz down to 1/32. 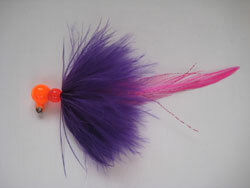 Twitching jigs is the easiest and most exciting ways to catch Pink salmon in fresh water. Humpies can't resist this medthod. Action can be fast and furious. 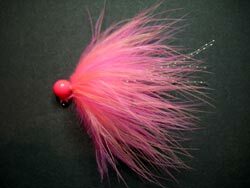 These Pink Salmon jigs are tied in six proven fish catching colors. Humpy jigs are tied on a 1/8, 1/4, 3/8, or 1/2 oz jig heads. 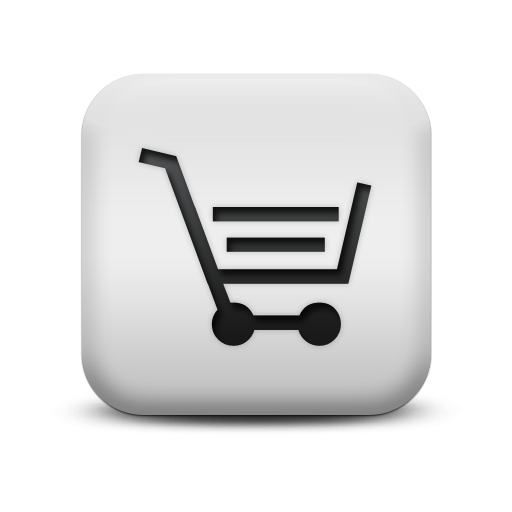 A special six pack is available on the jig package page! Twitching jigs without a float is one of the most exciting ways to catch salmon. Many times those stubborn salmon will hit a twitched jig when all else fails. Action can be fast and furious. Sometimes they will hit so hard they can take the rod right out of your hand, so hang on! 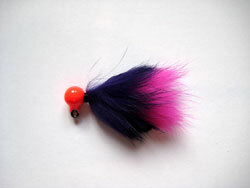 These Twitching jigs are tied in a variety of fish catching colors. Marabou is palmered in front of crystal ice chennile to insure great action. 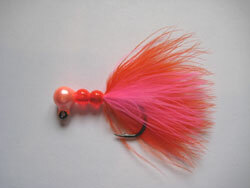 A chenille scent colar and a tail made of crystal flash gives these jigs a look that salmon cannot resist. These jigs are tied on a 1/8, 1/4, 3/8, or 1/2 oz jig heads. ©2019 2012 Brad's Jigs. All rights reserved.